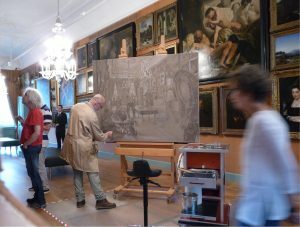 After the preparatory stage in the Conterfeyter studio, finally the time has come to start with the actual painting activities in Galerij Prins Willem V. And what a place to be! This gallery space is a truly unique and historically important site, because it is not only the most beautiful, but also by far the oldest picture gallery in the country – especially built for that purpose by Prins Willem V, the last ‘Stadhouder’ of the Republiek der Zeven Verenigde Nederlanden. 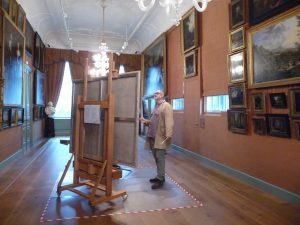 Surrounded by the weight of history and with all these important paintings of famous predecessors surrounding him, this painter can’t help feeling both intimidated as well as challenged. Undoubtedly as a sign of the commencing work on the feshly arrived canvas, but also as a reminder that all these surrounding paintings once must have smelled very much the same, the glorious odors of turpentine and linseed oil slowly start filling the gallery space. 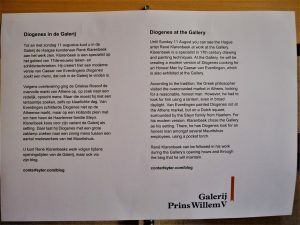 On the backside of the easel, a sheet of paper is attached, informing the gallery’s visitors about the intriguing history of the Greek philosopher Diogenes, the inspirational and art-historical connection with the Van Everdingen painting exhibited on one of the gallery walls, as well as the artistic intentions and background of this special in-situ Conterfeyter project. In these first painting days in the gallery, the ‘dead coloring stage’ will be further elaborated, both in detail as well as in overall tonality. For the time being, the used paint as well as the tools remain basic, because the work is still performed with only three hog hair brushes loaded with three different tones of the same brown greyish color. Because of the specific nature of this color, in the seventeenth century this ‘doodverf’ painting phase used to be called ‘in ‘t grauw’ as well. 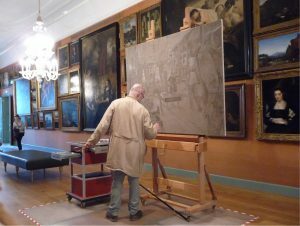 Interestingly, several of these tonal paintings have been preserved, clearly showing each artist’s own preferences in how detailed the underpainting should be and what type of gray or brown color should be used. In order to promote proper drying of the oil paint, at this stage only Turpentine oil (Oleum Terebinthinae) will be used as a painting medium. Compared to linseed oil, which will be used in the coming phases of the painting process, the etheric Turpentine oil is far less fatty and therefore more suitable for underpainting layers. The old painter’s wisdom “mager over vet bederft de pret” (=skinny over fat spoils the fun) is still the best advice to avoid awkward problems such as wrinkling, scorching and even craquelures of the paint skin. Hardly visible from a distance, but becoming quite annoying from up close, is the no longer necessary pinhole of the vanishing point, which still remains in sight. Even the seventeenth century master Johannes Vermeer is known for these pinholes, using the string method with inserted pins in at least thirteen of his canvases, enabling him to connect the orthogonals to the chosen vanishing point in the scene. Although essential in the first phase of the painting, at a certain point it is time to get rid of it. 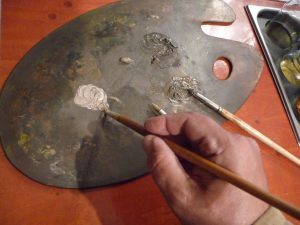 At this stage of the ‘dead coloring stage’, the painter’s palette only consists of the also previously used brown greyish middle tone, with to the left a lighter and to the right its darker variation. A mixture of this ‘doodverf’ oil paint will be used for repairing the pinhole as well. 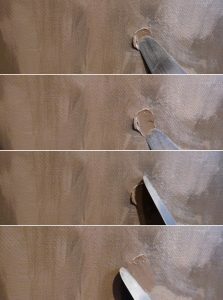 Before the pinhole can be repaired, first the unprotected linen threads around the hole have to be carefully covered and saturated with poly vinyl acetate, which has to be applied from the backside of the canvas. After this protection coating will have dried up thoroughly, finally the former vanishing pinhole can be filled up and levelled out using a painter’s knife with a neutral mixture of the oil paint from the palette. Finally, the under painting will be extended even further, while at the same time more details of the scene can be filled in. 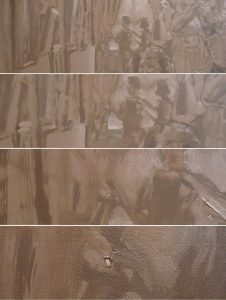 By adding yet more lead white and bone black to the already used tonal mixtures of the ‘grauwe’ oil paint, the general tonal range of the scene will obtain far more depth. Step by step the ‘dead coloring stage’ becomes completed. I’m very impressed and very proud of you!!! !